After a great evening, yesterday, of family togetherness around a large dinner (cooked by me), I fully expected that I would spend today resting but that was not to be. I don’t know about you, but sometimes I get a bit ‘restless’ and decide to do something on the spur of the moment…that would classify my day today. It started out nice & quiet, me knitting squares for the Ghana Project, but then I decided to go in the boy’s bedroom; that was a mistake! First I noticed that there were several baskets of clean laundry which I had not folded, so I decided to do that. While doing that, I began looking around the room and noticing that something needed to be done to somehow re-arrange the room. On the thought that we needed more room, I began moving some of the boys clothes and asking them “What fits?”; thus began my ‘trial’. Let’s just clarify this ordeal as a many-hours project which involved a huge mountain of clothes that will go to Purple Heart; 2 dressers being emptied and moved, then re-filled; several groupings of items which will be offered on Freecycle; a pile of objects belonging to oldest son (who has his own house going on 2 years now)-things like 6 years of his elementary school yearbooks, souvenir hockey pucks and other memorable findings and still-yet, a laundry basket of my husband’s old clothes which I was too tired to sort/toss out. The room has gained a good 4 ft. X 4 ft. area of floorspace and the “Wow!” factor from both boys, so I guess it was worth it. What ever happened to my RELAXING the whole day away? Beats me! Sometimes ya just gotta “Carpe Diem!” (Seize the Day). We had a grand dinner of twice-blessed leftovers (a small joke from the comic strip: “Pluggers”) and NOW I’m going to sit, knit and RELAX! Hoping you’re enjoying this holiday weekend. 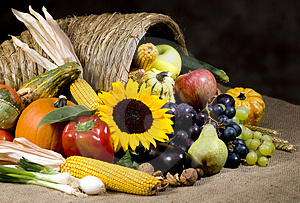 From our house to yours: may you have a blessed and Thankful Thanksgiving. Good Friends, Good Food – Good Afternoon! The visit was short and sweet as I had to get home for an evening choir practice for the Christmas contata. I must say-we certainly packed a lot into that short time period! “Momma” gave me her ideas on the sewing of “The Jacket” and also attempted to revive my memory on how to crochet a building blocks/basketweave type pattern which we both learned many, MANY years ago while working at the phone company. 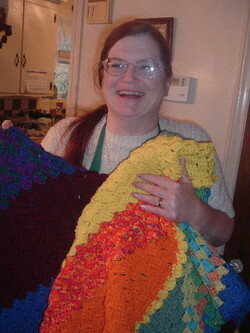 She has continued to use this pattern and crochet afghans, squares, etc. while I have only a small crocheted ‘starter’ piece I had saved in a drawer, hopefully being able to look at it and remember the tricky turns of said pattern. I even tried to duplicate it in the car on the way up, but alas, I could not. 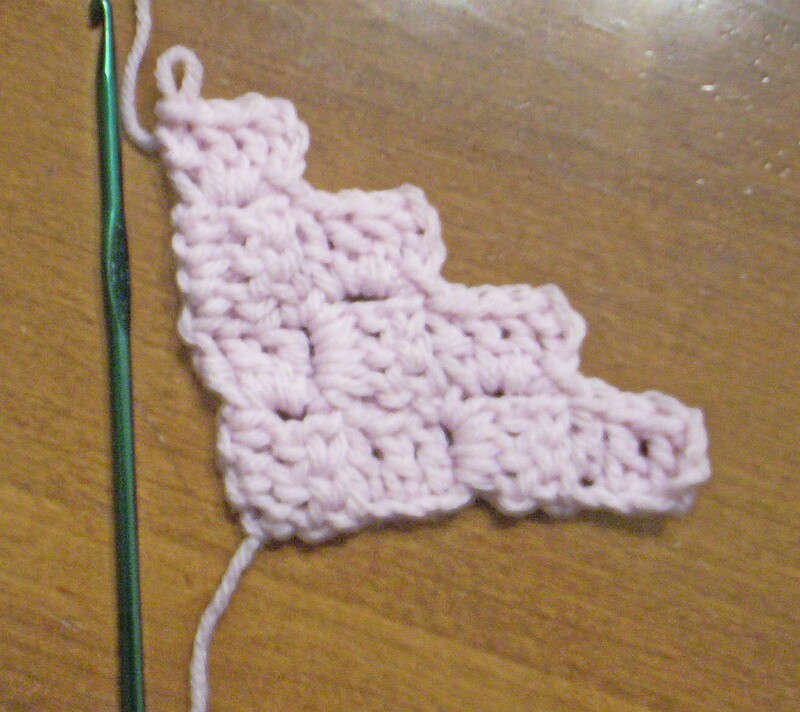 (Honestly…I’m not really certain I CAN remember the pattern, but will give it a good try!) Cooking tips, food tastings, sewing advice, crochet instructions, shrug modeling and photographing…it was a very FULL afternoon visit and we all enjoyed every single minute! Here is “Momma” modeling her shrug:Have a great weekend! 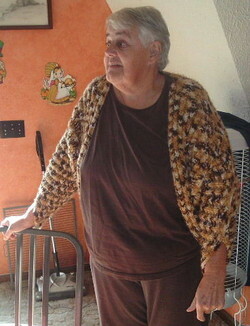 Today I finished “Momma’s” shrug and we’ll be delivering it Saturday-photo will follow later. Have you ever attempted a project that you’re not really sure you’re qualified for? I’m one of those people who say: “I should be able to figure out how to do this”…and then proceed to muddle my way through; sometimes this ends in great results and others, not so successful. My ever-faithful absolutely FAVORITE Fall/Spring jacket is a case in point: I purchased it about 5 years ago at a garage sale. I love this jacket-it’s all I could want: warm, comfortable, just my size, etc. The problem? After all the loving wear I’ve put into it, it’s beginning to look down-right shabby! Last year I added a grosgrain ribbon ‘trim’ to the top of the shoulders and the edges of the pockets simply because the material at those points was fraying; that worked for awhile. The other day, wearing said jacket, I dashed in the house and happened to pass a mirror…that was a shocker- my dearly loved jacket was looking like I belonged in the rescue mission! The material on my left shoulder was totally frayed and holey, the edging around the neckline was in shreds, there were big holes on the bottoms of the sleeves; all-in-all, it was time to trash the jacket. This really bothered me and set me to thinking (dangerous ground here)…”Maybe I could SEW another one!” I need to insert here that I am definitely NOT a seamstress! The sewing machine and I are NOT friends! 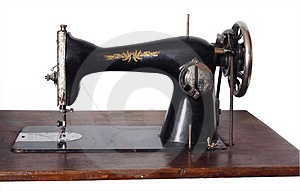 My sewing machine is circa 1940’s; it belonged to my Grandmother and Mother-it’s a Singer BASIC model electric, sews only forwards and backwards…that’s all! I took one sewing class in Junior High School and hated every minute. At the end of the class I had accomplished sewing the requisite ‘apron’ and a skirt…neither of which I would wear OR keep…they were a disaster! Since that time I’ve learned to become more versed in how to use said machine, but just barely, which brings us to the present and Ebay. Having searched on-line for sewing companies (Simplicity, Butterick, McCalls, etc.) I was able to locate a pattern circa 1995, for a jacket very similar to my old one, so I bought it through Ebay. It arrived last Saturday and I set out for JoAnn Fabrics with the notion that I actually COULD sew said jacket! I fumbled around for a good hour and finally located materials, sewing notions, etc. Today, having finished my shrug project, I sat down to review the directions. I don’t know if you’re like me in this area or not, but when faced with a project that I’m not very confident in, I tend to procrastinate. Yes, I read over the pattern; yes, I reviewed all the details…then promptly packed it all up and will attempt it ANOTHER DAY! I have to be in the right frame of mind to actually TACKLE something like this. This is NOT the first time I’ve done that; I remember deciding I could actually sew a quilted headboard for our oldest son when he was about 1 year old. It was a lovely kit, many MANY pieces of various quilting materials all of which would form a wonderful, multi-car train, complete with grey corduroy clouds of smoke coming out of the smokestack! I can’t tell you how many times I hauled that kit out, read it, got confused/scared and packed it all up again; probably a good year or more, at least. Finally one day I felt like I needed to just screw up my courage and DO IT! Did it look like the pattern? Yes. Was it totally, exactly like the directions? NO, but in the end I had accomplished creating a wonderful steam engine train with multiple colorful cars and I was happy. NOW we come to today: yes, the directions are now resting in their cute little paper packet. It was suggested by Dar that if I get really stumped I could ask “Momma” for help…great suggestion and I will definitely keep that idea in mind. WHEN, you ask, will I actually tackle this jacket? Well my friends, I have ALL WINTER to give it a shot! (and that’s what I’ll probably do…). Our weather has turned cold-we’re in the 30’s with light snow on the ground which leads to me dragging out my winter jacket. I hate to conceed that it’s now time to give up Fall and crawl into winter (you know how much I dislike the cold weather/snow). Hope you’re having a WARM, great day! Just sent the 2 yr. old grandson home (after having him for 5 hours); sitting here ‘relaxing’ and sipping some nice, hot orange spice tea. In a few minutes I’ll have to jump in my minivan and, along with youngest son, go pick up a slightly used twin bed mattress for our bottom bunk bed. You see, youngest decided to move his bed upstairs, so there went the second mattress and lately it seems we have no spare bed for any overnight teens. It’s now starting to become a lovely fall afternoon, after a very chilly morning filled with grey clouds, some rain and generally a poopy day (so glad to see the sun!). We’ve already had our first snowfall, I think it was Monday-not a lot of snow, but enough to cover the ground and keep us shivering at the 30 degree temperature (just a forethought of temps to come, I’m sure). Hey, it’s Michigan-time to get used to the cold! (Can you tell I’m no fan of cold weather/snow/winter???). You’re the time of day right around sunrise, when the sky is still a pale bluish gray. The streets are empty, and the grass and leaves are a little bit sparkly with dew. You are the sound of a few chirpy birds outside the window. You are quiet, peaceful, and contemplative. If you move slowly, it’s not because you’re lazy ? it’s because you know there’s no reason to rush. You move like a relaxed cat, pausing for deep stretches that make your muscles feel alive. You are long sips of tea or coffee (out of a mug that’s held with both hands) that slowly warm your insides just as the sun is brightening the sky. Sometimes a little mindless fun is just what you need to sort of let your mind ‘veg’ a little…at least they amused me yesterday! PS: Boy, sometimes you’d think I’d forget my head if it wasn’t attached! I originally started this blog with the idea of saying that I only have 5 inches more to knit on “Momma’s” shrug, then it will be ready to sew it up…then it’s done! YAY! PSS: Have you ever had a project that seemed to be ‘never-ending’? The shrug for “Momma” is becoming just that. I thought I had measured correctly and only had 5 inches to complete, but upon stretching it out on the floor for a more exact measurement with the metal tape measure, it seems it’s more like 8-9 inches! That wouldn’t seem like much, but it sure seems like I’ve been laboring over this item for months! Sorry for the complaining-just hoping to get it finished and to my dear friend BEFORE Thanksgiving! $1.99/9 for a gallon of gas tonight! Can you believe it? I can’t remember when I paid that low for gas; this was at a Valero station (this company is new to our area). While driving back & forth to church this evening taking youngest son to a Teen evening, I was checking out all the local gas stations. Most were hovering at around $2.29/9 for credit, or $2.09/9 for cash sales. When I pulled into the Valero station, their sign said $2.02/9 but when I went to actually pump the gas the pump read $1.99/9…ya could’ve knocked me over with a twig! The weather is getting colder and rainy…looks kinda like we could be in for the “S” word soon…Yuck! Sometimes I’m just ‘behind the times’ when it comes to certain ammenities; specifically: music on CD. I know that might sound a bit strange, but I just discovered (again) how much I enjoy knitting and listening to music. Our household is full of guys who love to play video games; we have 2 tv’s and 2 computers, hence I live in a ‘media household’. At any given time (when all are home) the sounds emitted are, to me anyway, bothersome. Last week I found myself in a quandry: I was wanting to knit IN QUIET and the surrounding ‘air’ was filled with all sorts of sounds from “Guitar Hero” (youngest son), some sort of army/fighting game (middle son) and “World of Warcraft” (husband). I was getting frustrated, to say the least! My youngest suggested I borrow his cd player & headphones and listen to a cd of my chosing. Let’s just put it this way: I don’t HAVE many music cd’s! I dug around and found a REO Speedwagon cd (“You Can Tune a Piano, But You Can’t Tuna FIsh”)-great cd-ROCK & ROLL! The guys were chuckling at my bopping around (while sitting in my recliner) and singing to my heart’s delight. It’s been a LONG time since I’ve enjoyed doing that; it brought back fond memories of my single days when I would come home from work, put a stack of 5 long-playing records on the player and knit…good times! This memory and the current experience brought me to the present; went to Amazon.com and ordered cd’s of several favorite groups (“Chicago”, “Bread”) and am looking forward to ‘bopping and knitting’ a lot in the future! When I sat down and tried to remember some of the groups I used to like listening to, I was almost stumped. I don’t listen to radio these days, just not fond of much of the so-called ‘music’ of the day. Am thinking of checking upstairs for the boxes of old LP records and beginning ordering some of my old favorites…on CD! Look out world, GrammiePammie’s Rockin’ & Knittin’! 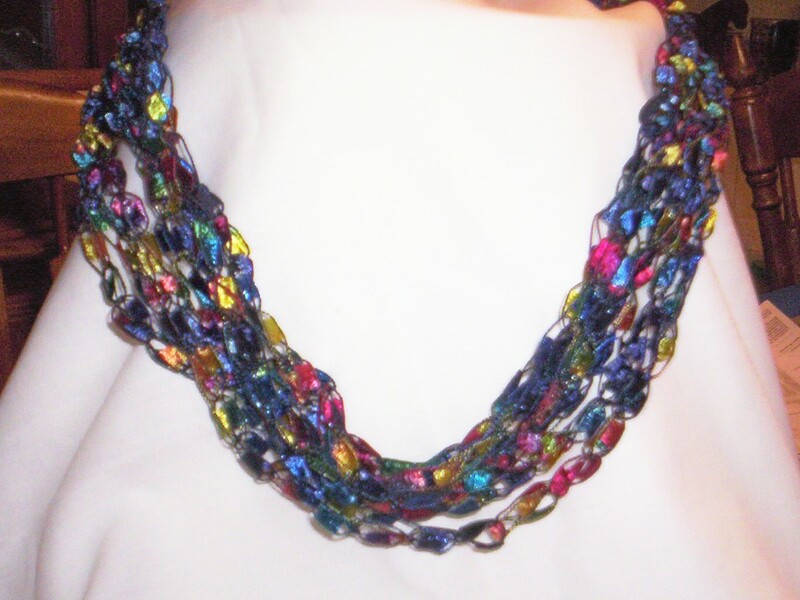 One of my friends at church brought this idea-a crocheted necklace made from ladder ribbon. I had never seen anything like it and (of course) immediately wanted to learn how to make them. (Please excuse my necklace ‘model’…she’s only a roll of paper towels and a white pillow case, but she serves her purpose). The ladder ribbon comes in a variety of colors, I chose a bright multi-color; mine didn’t come out as ‘open’ as the original, but it will work. The finished product ends up looking like a string of colorful beads (my photo doesn’t do it justice) and the necklace is very light and airy. Total time to make? about 45 minutes; experience level: very easy-just simple chain stitch. You can get about 3 necklaces from one ball of this ribbon, so it ends up being very cost-efficient also. ps: I made mine in the ‘large’ size-you can also make them in small and medium. To say I was thrilled is putting it mildly; I treasure our friendship and I’m very glad to call her my close friend. I hope that in your lifetime you can experience at least one close friend who knows all your secrets, all your faults, and still loves you just the same. They are very precious and rare; to be treasured and kept close to your heart. 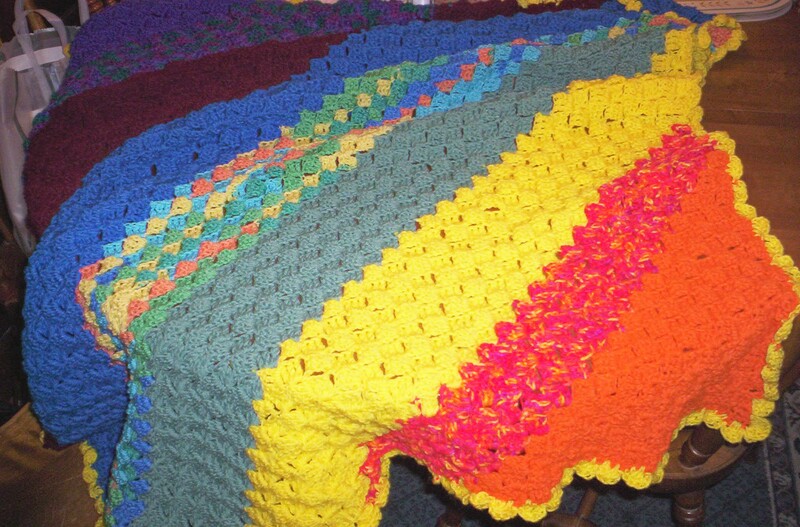 ps: I tried my best to photograph the afghan because I wanted to share all the wonderful color changes “Momma” incorporated into it, but my photography skills didn’t quite match up to my expectations. Oh well…you get a kind of idea of it’s spendor, anyway! Here’s the afghan (and me)-“Momma” decided to capture the moment! Tags: friendship, Knitting, The "Ghana Project"